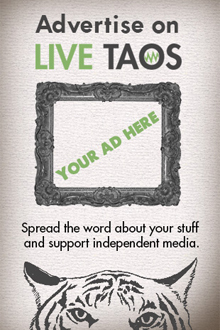 Editors Note: Tales from the SLV is a new LiveTaos.com column by former Taos resident Nikki Lyn Pugh. 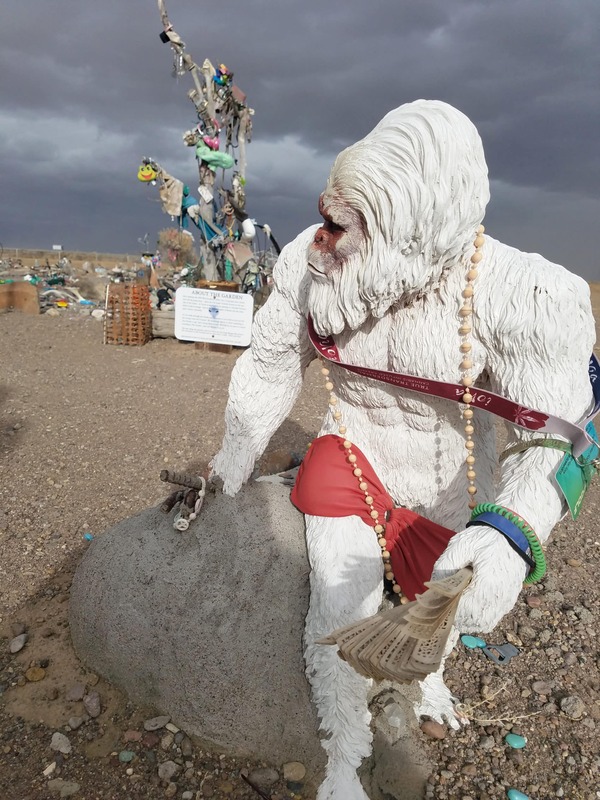 Join us each month as Nikki lets us know about our northern neighbors’ quirkier corners and more interesting characters. When I moved to the Luis Valley (i.e. the “SLV”) from Taos about a year and a half ago, it was the allure of those harsh and awe-inspiring peaks that brought me here. I lived in Crestone at first, in a little subdivision in perfect view of Challenger Peak and Kit Carson Mountain. As I began to make the trek between Alamosa and Crestone more often, however, the swath of flatland on either side of Colorado State Highway 17 began to get my attention more and more. The boundaries of the SLV are fuzzy. Some say it runs south to north from the New Mexico border along Highway 285 near Antonito up through Salida, Colorado and east to west from the San Juans to the Sangre de Christos. Others have a more generous view, taking the SLV all the way down to the Taos Plateau about 40 miles north of town. Whatever the physical boundaries, there’s no denying that, geographically speaking, the entire valley is as pressed down and golden brown as a pancake. Millions of years ago, the Valley was the bottom of a giant lake. It is not hard to imagine, especially if you drive along Colorado 17. On dust storm days, older telephone poles bend and visibility is limited to about two feet as white dust from Great Sand Dunes National Park and reddish-brown dust from worn-out agricultural lands swirl and clash across the highway (Dust Bowl days, anyone?). On clear days, however, a driver can see from one end of the basin to the other, about 40 to 75 miles in every direction. The area also has the distinguished title of being the “largest” of many things: it is the largest alpine valley in world. It sits on top of the second largest aquifer on the continent. It often breaks records for the coldest place in the U.S. during winter. 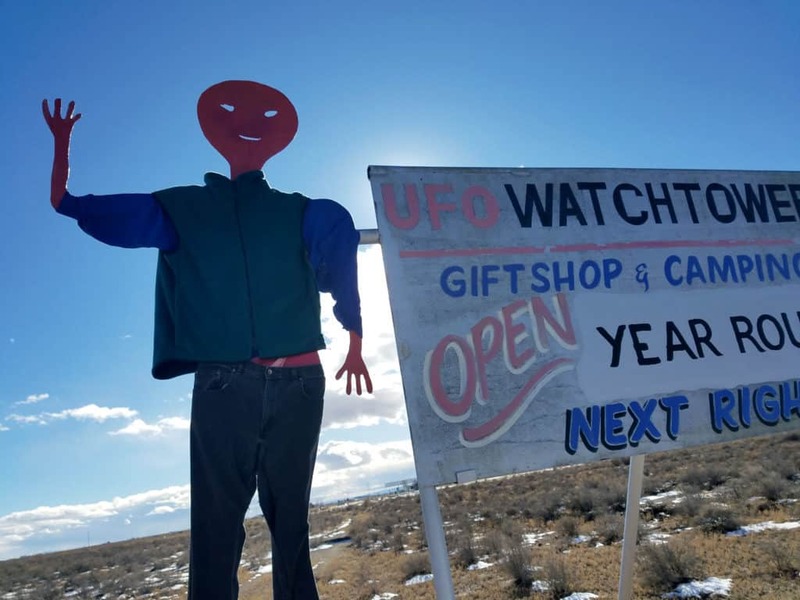 And according to Candace, who works at the UFO Watchtower (more about that later), the SLV is the third-largest hot spot in the world for extra-terrestrial activities. The conquistadors told tales of strange lights in the sky in the 1560s. In present day, some real estate offices made clients sign waivers indicating that they knew there was UFO activity. The first stop for most folks searching for the unusual along the Cosmic Highway is Judy Messoline’s place, the UFO Watchtower. The Watchtower is located right off the highway about 30 miles north of Alamosa. Judy opened her place 12 years ago after her initial venture — cattle farming — went bust. “Guess I’m just not cut out for ranching,” Judy explains in her book That Crazy Lady Down the Road. 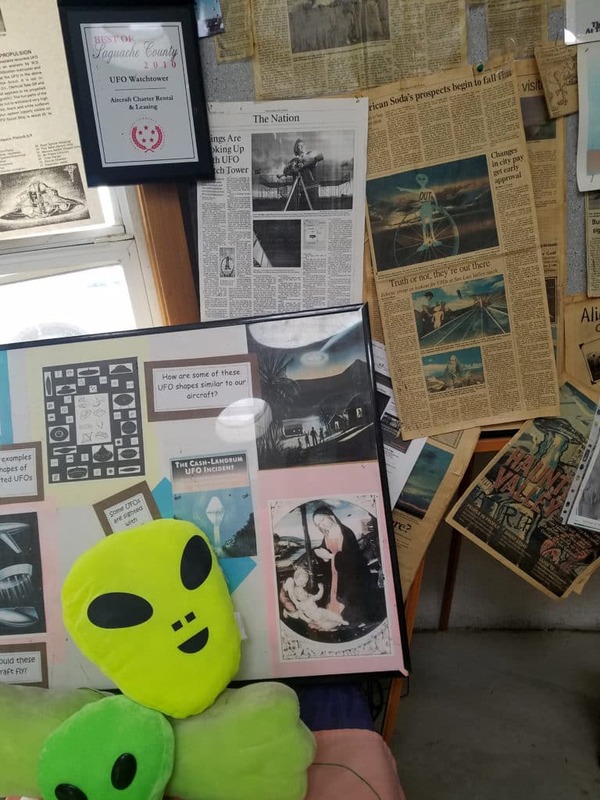 What she was cut out for was to run the only UFO Watchtower in the U.S.
On the day I decided to pop in and finally meet Judy, after living in the Valley for almost two years, she was home in bed with the flu. Instead, I met Candace, who was bundled up in three jackets sitting behind the register inside the Watchtower. It was windy outside and bitter cold, but not much better inside. The heat was out. Candice was doing Judy a favor and looking after the place for the day. It’s what friends do. My partner and I chatted with Candace for a while, avoiding going out into the blasted wind again. I asked her about the sightings. I could tell that Candace was serious and so was the binder she plopped on the counter for me to look at. Hand-written letters about strange sightings, vague recollections, lights in the sky, all of them three-hole punched and placed inside. Many of the tales also made their way into Judy’s book. Eventually we made our way outside to the rock garden. 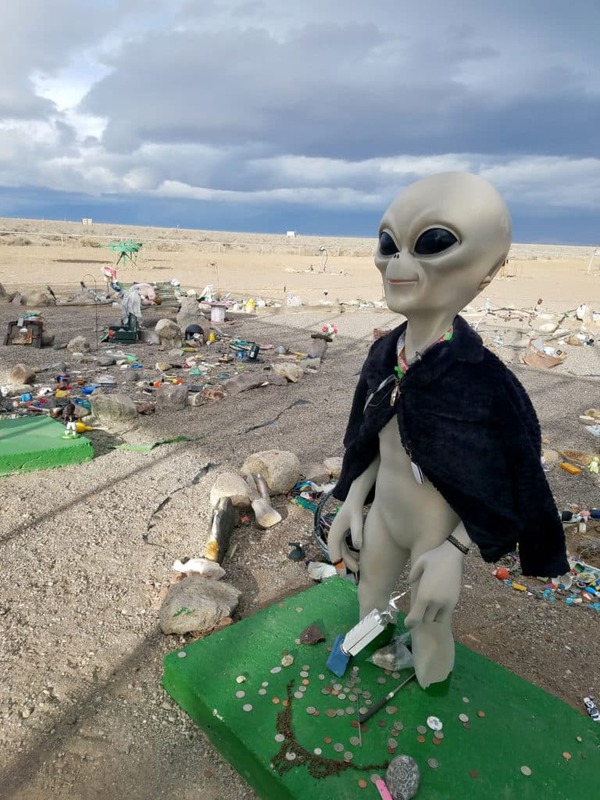 A meandering path wound around pockets of colorful doo-dads, human (or alien)-sized, big-eyed dolls and wind-washed remnants of trinkets. Folks had left all the items to be blessed by the energy of the place. There were stuffed animals, key chains, fake flowers and an entire bed of pens stuck in the sand like plastic string beans. Maybe Candace was right. I mean, everyone I know in the SLV has had some kind of interaction with the weird and unidentified, myself included. Blinking lights, streaks in the sky, and high-tech military fly-bys … But more about that fun stuff in future columns.